A lot of space, a small set-up area, and everything is tidy! 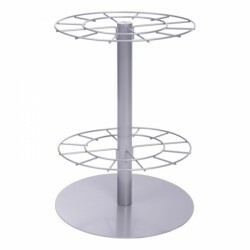 The Slashpipe combined stand is a space-efficient storage system for up to 16 Slashpipes. The Slashpipes are placed upright in the stand and are immediately ready to hand. It is suitable for the use at home, at training spaces or at therapy rooms.